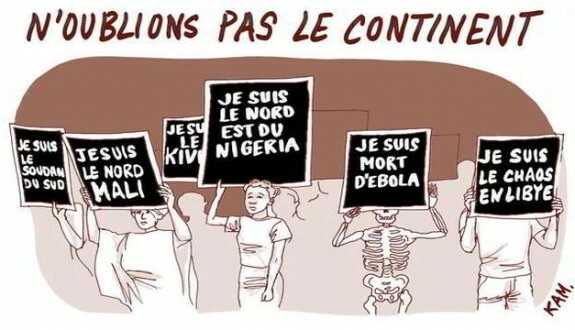 "Let us not forget the continent: I am the northeast of Nigeria"
On January 8th, as the world was tuned into the unfolding, scathing attacks in Paris, BBC News published a story that was initially overlooked. According to the news agency, upon interviewing a senior local government official, as many as 2,000 people could have been killed in attacks by Boko Haram on the town of Baga, Borno State, that began on January 3rd. Although accurate and verifiable estimates of the actual number of victims are difficult to obtain, Amnesty International argues that this “could be Boko Haram’s deadliest act in a catalogue of increasingly heinous attacks carried out by the group.” Although no journalists or government officials seem to have visited the town since the siege, reports from people who escaped from Baga are terrifying. As one survivor told Al Jaazera: “They followed us on motorcycles and trucks. They shot and hacked at us. We were trampling on dead bodies as we ran in the bush”. Despite reaching some important news outlets, public outrage and condemnation at the news did not come anywhere near as close to the reaction against the Paris attacks or any despicable activity by the Islamic State in Iraq and the Levant (ISIL). Indeed, as three John Hopkins University scholars highlighted in an article dated October 2014, “the worsening conflict in northern Nigeria already has suffered more casualties this year than the world’s most publicized contemporary wars.” It was only after Amnesty International released terrifying satellite images of the towns on January 15th, comparing before and after the attack, that the news gained more traction in the public domain. Yet regardless of limited coverage or interest, Boko Haram’s power and activities are growing as the group continues its murderous activities, persistently taking the lives of more civilians. In recent shows of solidarity, however, citizens of Montreal and Paris staged demonstrations for the families of those who were targeted in the Baga attack. Yet, unfortunately, the Turkish government and the European Union were the only two institutions represented at the Paris March that condemned the most recent attack by Boko Haram. Not even Nigerian President Goodluck Jonathan himself, who in a press statement on January 8th expressed solidarity with the French people following a “dastardly terrorist attack”, condemned or reacted to the Baga attacks for more than 10 days. The only comment that was made by a Nigerian official was a press statement by Ministry of Defence spokesman Maj. Gen. Chris Olukolade who stressed that the actual number of victims was 150, rather than the “exaggerated” 2,000. It is not the first time that Nigerian public officials have been silent on such attacks, especially in a period of electoral campaign, and perhaps this is one of the most worrying aspects of Boko Haram’s insurgency. Unfortunately death has become such a frequent and recurring theme in the country, that those in positions of power seem to have almost become detached from and immune to it. Despite a short-lived international outrage in April 2014 over the abduction of the Chibok schoolgirls, neither the Nigerian government nor international actors have successfully managed to hinder the group’s increasing influence and expansion, both in military power and territory. Last August, the supposed leader of Boko Haram, Abubakar Shekau, declared areas of Northern Nigeria under their control to be part of the group’s “Caliphate”. This declaration came with a shift in Boko Haram’s tactics: from hit-and-run terror attacks to appropriation and consolidation of territory, ever more trying to imitate their counterparts in Syria and Iraq. According to the UN Assistance Mission to Iraq (UNAMI), 7,725 civilians were killed in Iraq in the first nine months of 2014, which are not substantially more than the 5,156 Boko Haram-related deaths in the same time period. In Boko Haram’s lifespan, 2014 was thus as deadly as the preceding five years of the group’s insurgency and possibly its most ‘successful’ militarily. Indeed if, according to a recent Telegraph article, Boko Haram currently occupies about 20,000 square miles of land, the group would have control over an area that is bigger than Wales and the English Midlands together. If it is not alarming that a group that has committed widespread atrocities and continues to terrorize innocent civilians has such wide swathes of territory, what should be? Moreover, it is incorrect to say that this problem is confined to the three states that have been declared under a state of emergency (Borno, Yobe and Adamawa). 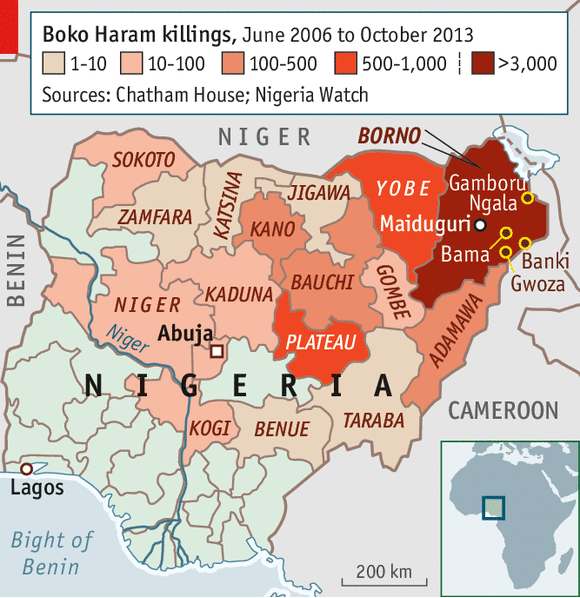 An L.A. Times map showing all attacks committed by Boko Haram between 2009 and December 2014, actually demonstrates the group’s ability to attack different parts of the country, not only the less wealthy north-eastern areas. Moreover, for the past year the group has also been actively hitting targets and committing atrocities across the border in north-western Cameroon. In mid-July, Boko Haram militants went as far as kidnapping the wife of Cameroonian Deputy Prime Minister Amadou Ali, who was later released in mid-October. More recently attacks on Cameroonian soil have intensified. Within the past week alone, the country has come under attack at least twice. On January 12th, Boko Haram militants attacked a military camp in the northern town of Kolofata, in the Far North Region, but were repelled by the Cameroonian army who left 147 insurgents dead. Yet, not all of the group’s activities have been successfully resisted. Last Sunday, a day after the Chadian government sent support troops to help Cameroon fight the group, Boko Haram attacked the villages of Maki and Mada in the Tourou District, Far North Region, and abducted at least 80 men, mostly between the ages of 10 and 15. This most recent attack shows the group’s strength and capabilities that, according to Former Chief of the U.S. Africa Command Gen. Carter Ham, “surpasses any of the nations’ commitment” to stopping the insurgency. As Freedom House’s Regional Director for Africa, Vukasin Petrovic, said in a press release: “the images released [by Amnesty International] are incontrovertible evidence that the human rights situation in northern Nigeria is only getting worse.” Mr Petrovic also stressed that “the Nigerian government needs to take more active steps to protect its citizens and end this on-going crisis.” Yet, it would seem as though the Government and its departments are too entrenched in running a campaign for February’s election to address the country’s pressing problems. President Jonathan’s “surprise visit” last Thursday to an Internally Displaced People’s camp in Borno seemed to be nothing more than a squalid media show in an attempt to avoid a poor electoral result. On the same day, in an interview with CNN, Maj. Gen. Chris Olukolade went as far as saying that although “the activity of terrorists is prevalent in certain isolated communities, here and there […] we have never conceded that any portion of Nigeria is under their control”. Maj. Gen. Olukolade went on by expressing his “concern” regarding the allegations of human rights abuses within the military, “as it is not consistent with [the military’s] pattern of operation”. Not only are both statements factually incorrect, as Boko Haram is in full control of several districts and the army has committed severe human rights violations, but they show how much the army publicly downplays the threat and violence of the group, in order to declare that their power has not been conceded. According to US State Department Deputy Spokeswoman Marie Harf, although “the election is probably a factor” in the escalating violence in northeastern Nigeria, “[it] should still go forward even in the face of this pretty horrific violence”. Although she may be right that the election must proceed, it would be of no surprise to see a low turnout and a general disinterest on behalf of citizens to support institutions that many, especially in the north of the country, do not believe to be capable of protecting them. Unless the Nigerian government and its institutions manage to ensure its citizens their right to safety and property, the future looks all but peaceful for the country. Edwin is a Politics with Economics student at the University of Bath. He is currently on his placement year and working for HART as a Research and Campaigns Intern. He is interested in conflict, religious terrorism and the impact of these on civilians.